Two lions stand in front of the main building of Martin Luther University Halle-Wittenberg. The broad staircase in front of the building is a popular meeting place for students from the city on the Saale. Elisabetta Legnani and Nora Mittelstädt are sitting on the steps for a chat between lectures. The two young women, from Italy and Germany, are both enrolled on the same course: “Europäische und internationale Wirtschaft” (European and International Business). A small programme but with great prospects, they both agree.What is so special about the Masters course is the partnership between Halle University and the Università Cattolica del Sacro Cuore in Milan, which leads to a double degree. The project has been running for five years. Around 20 young men and women have already completed their Masters, each having spent two semesters studying abroad.Elisabetta Legnani is enthusiastic as she talks about the excellent professional prospects that the course offers. Her stay in Halle ends in the summer. She believes that German skills she has learned will be particularly useful, and that the Masters is the ideal addition to her Bachelors degree in political science. Elisabetta is still unsure whether she will work as a journalist or at an international institution. Nora Mittelstädt has rather more time to make her professional choices. Having completed a degree in Romance languages in Leipzig, she was looking for a new challenge. The programme offered by the two universities immediately appealed to her ‑ not least because she had already spent two semesters studying in Italy, and could now make good use of her language skills. The last block of her degree will start in Milan in the autumn. A later switch to journalism is a potential option for Nora, but she can also see herself working for an international organisation such as UNESCO.Jobs likes that are genuine possibilities for graduates of the international programme, Prof. Dr. Martin Klein assures us. He cites the example of one former student who now has a permanent job at the South Tyrol parliament. One advantage of the partnership, Prof. Klein believes, is that each partner retains its own system and simply integrates the students ‑ an average of ten each year ‑ into that system; this works extremely well. Martin Luther University focuses primarily on business subjects, whilst sociology and politics are at the centre of courses at the Università Cattolica del Sacro Cuore. Individual options and the entire range of courses at each university are also open to each student.For his own university, Prof. Klein sees partnership with the Italian Catholic university as “a great opportunity to drive forwards internationalisation”. The degree course has long been accredited, but he would now like to see it expanded. Students build up a whole new store of experience even during the course. A range of funding options are available to the young people, as Prof. Klein explains. For example, the German Academic Exchange Service (DAAD) offers scholarships for the German students in Milan ‑ useful not least because living costs in the city are far higher than in Halle. Elisabetta Legnani and Nora Mittelstädt value the excellent training they are receiving in the two cities. They also, and perhaps even more importantly, value the chance to experience for themselves a Europe that is growing ever closer. Personal experiences count. “They are like countless little building blocks that together create a strong foundation for later professional life,” says Elisabetta. To her, the opportunity to get to know different mentalities is a great asset. Nora agrees. Meeting so many new people during her two-year Masters programme was a valuable experience. “Something like that stays with you. It broadens your horizons,” she believes.The Università Cattolica del Sacro Cuore in Milan was established 1921 by a private body, and was granted the status of state-recognised private university in 1924. 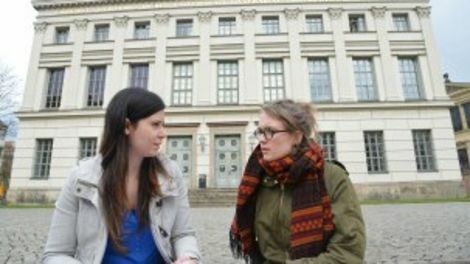 Caption: Italian student Elisabetta Legnani (left) and German student Nora Mittelstädt sit in front of the main building of Halle University, where both are studying “European and International Business”.